What is the right e-reader size for PDF files? The release of the 7.8 inch Kobo Aura One raises the question on what makes the right size to read PDF files. The answer depends on use-case scenarios. For example, many humanities books come in an A5 size and the 8 inch form factor is ideal for these books. On the other hand, science books and complicated PDF files, with a two column layout, require closer to 10 inches to be comfortably read. Similarly complex magazine pages are better suited to larger colour tablets. Personally, I find the eight to nine inch e-reader to be the right size. At this size there is the right compromise between size for comfortable reading and portability. It is not too small, e.g. six to seven inches, but not too big for one-handed reading. The portability and convenience of a smaller form factor makes a big difference for long reading sessions, especially outdoors or in tight spaces on public transport. I prefer to read in portrait but can switch to landscape, if half a book page is viewable and text size is legible. With six inch e-readers the landscape view often gives you snippets or small text and it is easier to lose your place within a larger book. Another important factor to consider, especially with the eight inch e-reader, is the right software to optimise reading with an eight inch screen. With KOReader, for example, it is possible to set reading to scroll mode and alter PDF page margins. Accordingly, many PDF files can be comfortably viewed and navigated, considering the restrictions of a smaller eight inch screen, in portrait mode. There is no option for an e-reader, larger than 6.8 inches, from either Amazon or Kobo. With this space existing smaller vendors have sought to meet the demand for larger e-readers, with some releasing re-branded Onyx and Boyue devices. The reviewed e-reader is a re-branded Boyue device and is near identical to an eight inch e-reader released by Artatech (Inkbook 8). Overall, neither Icarus or Artatech significantly develop the stock firmware released by Boyue (Energy Sistem, in comparison, does somewhat develop the software for their range of six inch e-readers). Energy Sistem, Icarus and Artatech all release re-branded Boyue e-readers with Android (usually Jelly Bean) pre-installed and thus the possibility to install external applications. In many ways, installing Android applications enriches these devices but there are drawbacks. First, there is no consistency, with many external Android applications not optimised for E-Ink, as they are designed for tablets. Many fonts require changes to weight, anti-aliasing and extra-contrast to work with E-Ink. This is accentuated in the case of the Icarus Illumina XL 8 due to the relatively low resolution and E-Ink Pearl. If there is to be a larger e-reader then software development should consider the hardware used, with its limitations and potentials considered. As an example, Amazon’s entry level Kindle comes with an E-Ink Pearl display and similar low resolution; in the case of the Kindle there is a bottom up approach in which software is developed while considering hardware limitations. For example, to remedy issues with a low resolution display, both font weight and contrast are increased. As stated, the operating system is developed by Boyue and based on Android Jelly Bean. The operating system comes with its own stock e-reader applications - Adobe Reader and FBReader. Regarding PDF support, the Icarus Illumina XL 8 comes with only Adobe Reader. For e-books, Adobe Reader is very limited and unstable (the application often crashes). FBReader is the better option - which can be set as default in settings - as it offers the option to increase font weight through the ‘bold’ option, other than better overall stability. Unfortunately, neither Adobe Reader or FBReader allow the user to export highlights and notes. Overall, both applications are bare-bone compared to other applications or Kindle and Kobo e-readers. Further, Many of the fonts pre-installed are not optimised for E-Ink and so it is left to the user to search for appropriate ones (fonts may be side-loaded in a designated folder). I recommend this link for E-Ink specific fonts (recommended fonts would be Miller, Minion and Constantia). More disappointing is a broken PDF e-reader - pinch-to-zoom doesn't work and selecting text to highlight often doesn't register. Installing external Android applications compensates for the limitations of the pre-installed software. However, returning to the discontinue between software and hardware, this burdens the user with testing different applications and fonts, something beyond most users, before settling on what works. For the experienced user, on the other hand, it makes the Icarus Illumina XL a versatile device. If the pre-installed software is poor then there are dozens of applications that are far better. I found Moon+ Pro and Bookari Premium to be the best of the bunch. To optimise both applications for e-ink, it is recommended to turn off page turn animations and to force bold some fonts. The premium versions of both applications can be purchased from Google Play and the APK extracted to be then side loaded and installed on the device.However, the free versions, with less features, can still be installed via the Good e-Reader application store. The store contains most e-reading applications. For PDF files then choices are more restricted. As most PDF applications, including Moon+ Pro and Bookari Premium, are designed for tablets then few come with an image and contrast enhancement feature. Image and contrast enhancement is a must for E-Ink screens, more so with E-Ink Pearl, as texts appear pale and difficult to read. EBookdroid is one of the few that allows picture enhancement, as well as being feature rich. The problem with Ebookdroid is that these features are hidden under layers of an overly complicated interface. Importantly, while an eight inch display is not ideal, it works well with PDF files. Complementing the eight inch across, the Icarus’s extra width means many PDF files can be read in portrait comfortably. When this doesn't work there is the option to turn files in landscape mode; with the larger screen estate it is possible to scroll through half a page, in landscape, with large text. A nuisance, if you decide not to use the pre installed applications, is that the user defined settings are not designed to work with Android applications. This means full-screen flush times, status-bar and brightness settings are optimised with the stock e-reader/PDF applications. It is possible to have the status bar appear with an external application but this takes part of the screen - only by hiding the status-bar do you get full-screen. Further, the pre-installed file manager opens e-books and PDF files with the stock software. However, there is a workaround by installing an Android file manager application, e.g. ES File Explorer, that allows the user to choose which application to use. Performance is very good. Applications work without hindrance and larger PDF files open and may be navigated comfortably (I tested the Icarus Illumina XL 8 with a PDF file exceeding 120MB and there was little lag or crashing). This crucial factor puts the device ahead of other e-readers. Compared to the Pocketbook 840 - an eight inch device I previously used - there is little stuttering, lags or crashes. Unfortunately, relative to other e-ink devices, the battery life of the device takes a hit with its dual core Rockchip RK3026 processor. Turning off the WiFi, with low or no front light, the user could expect three to four days of consistent use. With the WiFi turned on, however, battery life would be just over a day of use. As this is an e-reader it makes little sense to keep the WiFi working in the background. The display is adequate but contrast could be better. 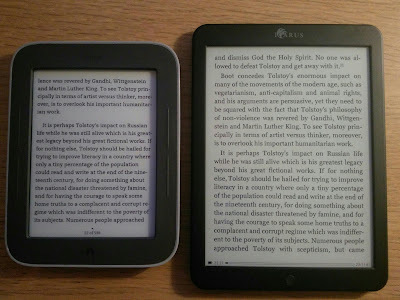 Many older devices and the current batch of entry level e-readers, with E-Ink Pearl, have better contrast. 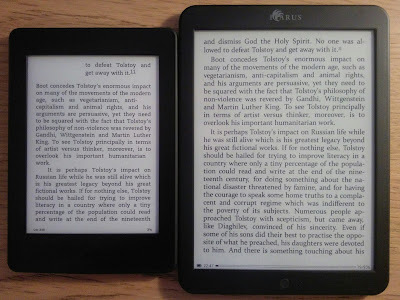 Differences are stark when compared to the Kindle Paperwhite - something expected with the Paperwhite’s E-Ink Carta screen and near twice the resolution. 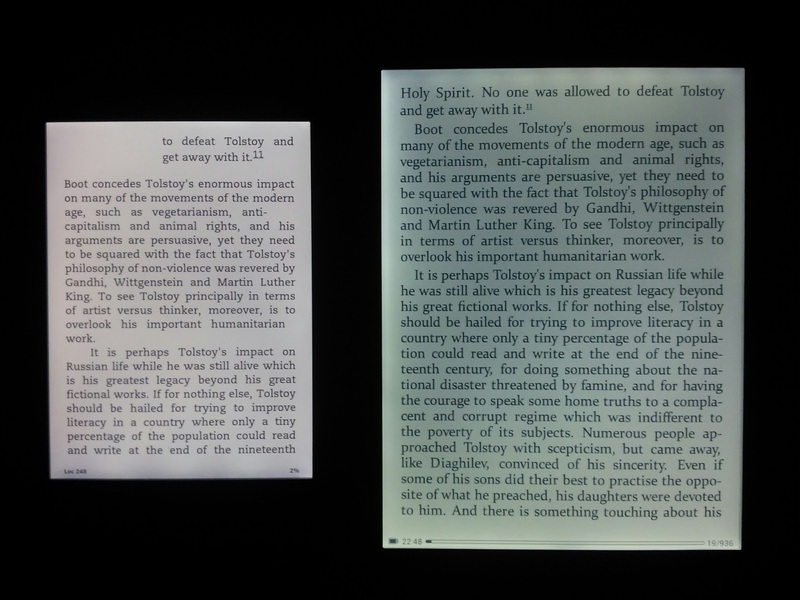 The front-light, on the other hand, is comparable to the first generation Kindle Paperwhite (late 2012) and despite LED lights at the top, bottom and sides of the screen, the lighting is not even and appears more cloudy when the front-light is increased (see pictures for comparisons). Compared to the Pocketbook 840’s front-light, the Icarus Illumina XL is noticeably inferior. Another problem with the display is significant ghosting. I would speculate this is another firmware issue, as it can be resolved by forcing a full screen flush when turning the device on/off or navigating the interface. In different ways the Icarus Illumina 8 XL is one of the better larger e-readers. Potentially, with the right software development, it could be even better. The main problem is Boyue’s sub-standard firmware, which is relatively untouched by Icarus. Allowing the user to install Android applications compensates, to an extent, for the firmware’s shortcoming. Before trying an Android e-reader, I was a sceptic. In many ways, I remain a sceptic. Key Android applications, e.g. Kindle and Kobo, offer a poor experience with e-ink. Further, many applications are designed for tablets and require a certain know-how to customize them to work with E-Ink. With that being said, I would rather an e-reader come with the option to install third party Android applications, as it offers good choice and many potential workarounds. Also, Android is an enhancement with the possibility to install applications such as Dropbox, Evernote, Instapaper and many more (I will devote a future post on recommended applications for Android e-readers). Overall, I like the Icarus Illumina 8 XL. It is light (275 grams) and large enough to be a viable PDF reader. Android makes this e-reader versatile and the hardware, with the right tweaks, works well with some applications. However, in my opinion, Android should not be there to compensate for poor software. External applications could be a very useful add-on but the default stock e-reading software should be designed so that most users do not need to customize and experiment to find solutions. Due to this, the Icarus Illumina XL is a niche device for the experienced e-book geek. For the general user, on the other hand, it would be better to stay away. Kobo's entry level e-reader, the Kobo Touch 2.0, has been released in Europe. In Germany it retails for €90 and £70 in the UK. Kobo's e-reading experience offers good/unique features; this includes adding fonts, text alignment, font weight etc.. The device hardware, in general, matches the entry level Kindle but costs £10 more. The pricing is a problem, as not only is the entry Kindle regularly discounted by Amazon, so is the Kindle Paperwhite, which often sells for £90. Even the Kobo Aura can be found for £80, which comes with the same resolution as the Kindle Paperwhite 2 and with a front light (also, its form factor is more compact and with a flush display). Overall, Amazon's e-readers are the better choice but Kobo offers good hardware and a refined e-reading experience. However, there isn't much choice, at the moment, with Amazon owning the biggest share of the e-book market. Barnes & Noble's Nook is now near exclusively based in the US and Sony stopped producing e-readers (Sony was a pioneer in developing e-readers and the uniformity of the six inch display may be traced to their early models). There are other manufactures, e.g. Pocketbook, Bookeen, Tolino and Carrefour's Nolim e-reader, but these are either based in national markets or are difficult to obtain and require importing. Barnes & Noble released their new premium tablet e-reader - it is essentially the second generation Samsung Tab S 8.4 but with Nook e-services (apps, e-book shop and e-reading experience) built into the firmware. Barnes & Noble's dedicated hardware endured heavy loses, when going against Amazon's range of Kindle tablets, that necessitated a turn in direction. However, instead of concentrating on improving their e-ink reader and developing more choice beyond the Nook Glowlight, Barnes & Noble thought it would be better to release vanilla Samsung tablets with some add-ons. The question then is why add a premium device, that sells for $399, when no similarly priced device was released before, whether as a Nook tablet or in partnership with Samsung. If the current range of Tab 4 tablets is to be replaced, then a partnership with Asus for an eight inch tablet (Asus Zenpad 8) and Lenovo (Tab 2 A10) for a larger one, would offer good specifications at a more value friendly price. My personal speculation is that the move to introduce an eight inch premium device, one with an excellent Amoled display, might be understood considering an earlier decision to partner with Samsung and purchase a stock of Tab 4 tablets. It is likely this is an attempt to add another option to the existing range of tablets with the Nook e-reading experience, beyond the more budget range on offer with the Tab 4 7 and 10.1. There is also, considering continuous loss, a large inventory of unsold Tab 4 tablets and it may not be workable to introduce a new range of partnered Nook tablets with other manufacturers. The Tab S2 could then be envisaged as a Nook offering with the existing Tab 4 range. Of course, the bigger problem was an attempt to offer some form of Nook device, even if it is nothing more than a Samsung tablet with some extra Nook features. When the Tab 5 is eventually released, as Samsung does continuously refresh its tablet line, then Barnes & Noble might need to significantly discount the Tab 4 range, as happened with the Nook HD and HD+ tablets, with a probable inventory of unsold device that need to be offloaded. Considering this, Barnes & Noble might decide to discontinue the Tab series partnership with Samsung, with one premium tablet being the only option to keep some form of Nook tablet. Going into partnership with another manufacturer could no longer be an option; however, this is Barnes & Noble, so it is difficult to predict or even understand what it decides next. It should be stated that tablet sales are on the decline, other than Amazon dominating tablets with an e-reader focus; hence Kobo, I believe, has taken the right path in discontinuing their tablet range and working on offering a wider range of good e-readers (when Kobo announced a 300 ppi Kobo Glo HD, Amazon followed straight after by unexpectedly bumping up the resolution of their excellent Kindle Paperwhite). The point is that varying the range of e-ink readers is the only viable path to maintain the Nook platform beyond third-party apps. Considering this, it makes better sense if Barnes & Noble revamped their out-dated e-reader firmware and offered better options beyond their only dedicated e-reader (Nook Glowlight). May be offer a 9 inch e-reader and another budget six inch one, similar to the Nook Simple Touch. However, we can predict, considering the trajectory of the Nook platform, that nothing will be heeded from Kobo and what will be made available is another standard six inch reader successor to the Nook Glowlight, barely keeping up with what is being offered by Amazon and Kobo, along with the Tab S2.